Originally set for a release date of March 8th, Brain Training for the Nintendo 3DS has had it’s big launch in the UK changed to April 12th. That means that potential UK buyers of the game will only have to wait a month more until they get their hands on the game. Neuroscientist Dr Ryuta Kawashima is the man that has helped develop the game with he’s own personal analysis and techniques. 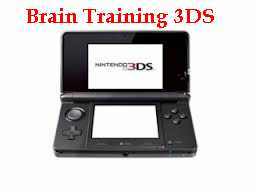 The game has already been out on the DS and it even had a sequel called More Brain Training. Now though, the 3DS wants to get in on the act and have the title too. The game is fairly simple, it is more about learning than anything else and the clue is in the title. There will be various different modes on the game, all of which will try to train your bran and get it thinking about loads of different things. It’s a very clever and neat idea and one that most definitely works. This title is very good for improving your memory and general all round focus in the long run. There are a total of 30 various different exercises for you to test your wits out. Also there are mini games thrown in the mix as well for you to try out. Having a quick game on Brain Training for a couple of minutes every single day can certainly pay dividends. You can even see if you are making progress and whether the game is improving your memory and focus over time. Depending on what difficulty you may be finding the games, the 3DS Brain Training AI will set the difficulty to what it think you can cope with. As soon as the game is out, you will be able to get it at all major game retailers and even at the 3DS shop as well.